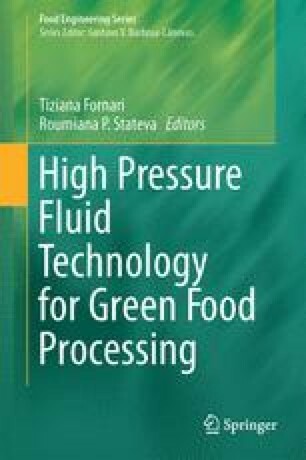 Knowledge of phase equilibria behaviour of food substances and green solvents under high pressure conditions is required to exploit to the full the advantages of high pressure fluid technology for green food processing. Data are currently available for quite a large number of systems at a wide range of conditions; still experimental measurement of high pressure phase equilibria is often difficult, expensive and time consuming. Thus, there is a demand for effective thermodynamic models to describe high pressure phase equilibria of solvents and natural substances. An essential element of these models is information about pure components thermophysical properties and, in the case when those are not available, capability to estimate them. In this chapter the framework targeted on modelling the thermodynamics of processes utilizing high pressure fluids will be outlined and an update of the available methods to estimate thermophysical properties of pure natural substances is summarized. T.F. acknowledges the financial support from Comunidad de Madrid (project ALIBIRD-S2009/AGR-1469). R.P. St. acknowledges the financial support from the Bulgarian Science Fund, Ministry of Education and Science (CONTRACT GRANT No: Б01/23).